Description: Empty coal from Portage, WI. Description: Another load of coal heads East led by an ACe. Description: A loaded coal train encounters a clear signal in "the sag", just north of Palmer Lake. Right behind this coal train is an Officer Special Train, actually in the coal train's block. Gotta love ABS-TWC. Description: BNSF #9398 and #9974 are sitting in the Lincoln, NE, yard. Description: BNSF 9398 is the dpu on a load heading down the Angora Sub Saturday morning. Description: Westbound coal empties roll through Memphis. Description: BNSF 9398 brings up the rear of a coal train headed towards St. Louis on the road's Hannibal Sub. 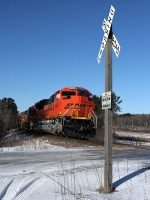 Title: BNSF 9398 heads up dpu. Description: These number board headlight ACes are no along aloud to lead on the BNSF. 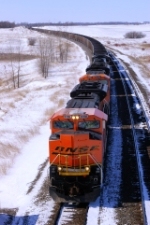 Title: BNSF 9398 is 2nd out on a ore train. Title: BNSF 9204 rocks a empty coal into old monroe 2nd of 3nbs. Title: Double the Ace's on a loaded coal train! Description: SB coal load coming out of Old Monroe on the k line. 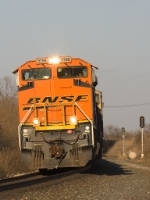 Title: BNSF 8757 New Ace headed back to the mines! Description: Empty coal train rolling up the k line at 60 Mph track speed is now back up.